To play poker, you must not only learn the game but the language, too. When you are in a room full of poker enthusiasts, and you hear words that sound like jibberish to you, then you need a serious dose of poker terms to be on equal footing with the pros who know their fundas inside out. Here's a small compilation of basic poker terms and meanings that will have you talking poker in no time. Presented in the order they occur in a game, these poker terms and meanings will help you understand the game better. Buy-in is the value of chips every player purchases before entering a game. This usually amounts to about 50-100 times the amount of the big blind. The button is like a chip but bigger. It is placed in front of a player who is considered the dealer of the hand. There might be a professional dealing the cards, but the dealer button is still used to mark a player. The dealer button is moved clockwise to the next player, at the end of each hand. The player with the dealer button is the last to place a bet in any round, and hence with the revolution of the button, every player gets the right to bet last. When each player has acted as a dealer, and the button comes back to the first dealer, then an Orbit gets complete. Blinds are the bets placed by two players sitting to the left of the dealer. These are mandatory bets. The player immediately to the left of the dealer places a small blind and the player to the left of the small blind places the big blind, which is usually double the amount of the small bet and defines the stakes of the game. After the blind, every player in the game is dealt two cards each. The dealer deals one card after another to each player, clockwise, till each player has two cards. Dealing starts with the player sitting to the left of the player with the dealer button. After the hole cards are dealt, betting rounds start with the player sitting to the left of the big blind. There are up to four rounds of betting in Texas Hold'em in which players can call, raise, and fold. 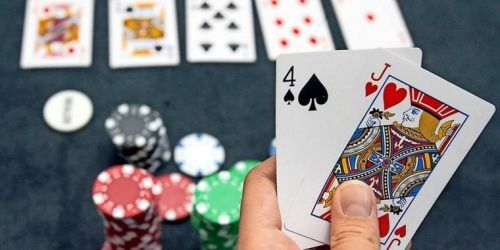 The part of the hand where the blinds are placed, the hole cards are dealt, and the first round of betting occurs comprises the Pre-flop. The player sitting to the left of the big blind begins betting in this round. Flop occurs when the first three community cards are dealt by the dealer on the table. These cards are common to all the players. After this, the second round of betting occurs. After the second round of betting, the fourth community card is dealt. It is also called the Fourth street. Post fourth street, the third round of betting ensues. After the third round of betting, the fifth community card is dealt, called the river or the fifth street. In River, the fourth and the last round of betting occurs. This is where all the money bet is placed. The winner takes the pot. Fold is a move in a betting round in which a player decides to not play with his/her hole cards. When it is their turn to bet, players can choose to throw their cards in the Muck and not put any money in the pot. This is a move, in which a player puts in money equivalent to that placed by the preceding player. At the beginning of pre-flop betting, it's equal to the big blind. A player can bet the amount placed by the preceding player plus the amount of an additional bet. The additional bet is equal to the big blind amount. The amount can be higher than that, if the rules permit. The big blind player can Check if no one raises in the pre-flop betting round. The big blind player plays without putting in any money. Check is like Call, but with no money involved. A poker round is concluded when each player on the table has had an opportunity to bet, and all the players left in the game have put in the same value of chips. This occurs when a player puts all the chips he/she has in the pot. If after the fourth round of betting there is more than one player left in the game, then the showdown occurs. In this, all the players open their hole cards, and the player with the highest hand takes the pot. In case of similar cards, the pot is split between winning players. Games in which players are allowed to put in all their chips in the pot at once, even if it exceeds the usual Raise amount. We hope you find this glossary of poker terms and meanings useful. Now, go talk the talk as you walk the poker walk. Is Cricket and Poker Similar?